What do you say when a great man dies? 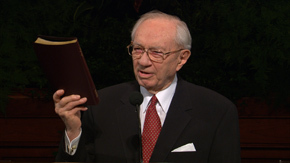 President Gordon B. Hinckley, age 97, Prophet and President of the Church of Jesus Christ of Latter-day Saints, passed away last night, after 13 years as head of the Church. I remember the day he became President (spring 1995, I was in my 2nd year of college and sitting, of all places, in the medical center at BYU when the news came over the TV). And I remember last night about 11 p.m. when I sat down on the couch, opened my laptop, and read it on Yahoo news. One of those things that you mark down in memory forever. I could mention, like the news media are mentioning - how many miles he traveled, his accomplishments, or basic facts about his life. All good. All important. But more important is what he meant to people, as a leader and an example. And what really matters, to me, anyway, is that his words, his earnestness, his humility, and his unfailing devotion never fail to make me want to be better. How can the value of such a person be overstated? And truly, that’s what it has been. Guidance, sure and unyielding - hope, and comfort (he was the prophet, during the dark days just after September 11, 2001), encouragement, new resolve to do better, to be better, to have faith and just get to work (he was the prophet when I was a missionary). And all of it delivered plainly and humbly. As I held her hand and saw mortal life drain from her fingers, I confess I was overcome. Before I married her, she had been the girl of my dreams, to use the words of a song then popular. She was my dear companion for more than two-thirds of a century, my equal before the Lord, really my superior. And now in my old age, she has once again become the girl of my dreams. I’ll echo many of the blog posts I’m reading today in saying that it’s a comfort to know he’s gone home to join her again. The Lord has permitted me to live; I do not know for how long. But whatever the time, I shall continue to give my best to the task at hand. He was the grandson of Mormon pioneers, and so often included stories in his talks. In the same October 2006 talk - a great lecture on faith- he told two unforgettable stories, one a story of the great faith of the Mormon pioneers in the Willie and Martin handcart companies, crossing the plains too late in the season, and getting caught in a terrible blizzard, from which they were rescued by help coming from Salt Lake. And the other, a story of great faith on a much smaller scale, of a widow, his wife’s grandmother, who had lost her wedding ring and prayed to find it. Such faith is the wellspring of activity. It is the root of hope and trust. It is this simple faith that all of us so much need. Maybe that’s why. So much could be accomplished with a little more faith. Sometimes life is incredibly complex, and full of noise and distraction and competing priorities, and sometimes sadness and difficulty and despair. But truly, perhaps a little more simple faith is what we need. At 97, having lived so exemplary, he has gone home to God, to his wife’s side, to sit down with Abraham, Isaac, and Jacob among the great prophets of the earth, the Church rolls on and a new prophet will be called. And above all this, his simple faith, centered on the Savior Jesus Christ, lives on in all the lives he touched. What more can be said of a man than that? Feel free to leave thoughts here or link up your blog if you’ve written.